24 hour / 7 days a week Port of Tauranga Shore Crane service. Cranes to suit all services up to 350 Tonne. The shore crane guide lists crane ratings in tonne. It is only a quick guide. Please contact us to discuss your exact requirements. Note: The working range chart has a crane with an 85 metre main boom. Most cranes would need a fly Jib to reach this height. All ratings displayed are subject to the ports allowable wharf loadings. Chart assumes crane centre is 6m from ships side. With smaller cranes this maybe 4m. Higher capacities at radius can be achieved with luffing fly jib and lift specific setups. 2 Tonne allowance has been made for hooks. It is also possible to use a luffing fly jib to reach up and over the ship. 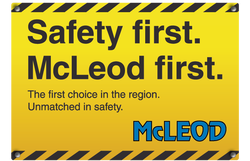 Contact McLeod for exact requirements.